NYFA's 14U Polar Elite team recently competed in the USSSA Class B Eastern National Championship tournament in Salisbury and Ocean City, Maryland. In a field of 76 teams from 12 states, Polar Elite finished in 17th place, going 2-1 in pool play and 3-2 in double elimination bracket play. Game 1 - Win 5-0 vs New Jersey Sparks. Pitcher Maya Kemper surrendered zero runs on two hits over six innings, striking out seven and walking none. Kemper was supported by a stout defense, which had no errors in the game. First baseman Alyssa MacKay doubled in the first inning to score the teams first two runs. Center fielder Hailey Irwin and catcher Shay Lieb each had two hits. Game 2 - Loss 4-0 vs Mid-Hudson Rebels Blue. Polar Elite fell behind early and couldn't come back against a tough team from New York. Pitcher Paige Loudenslager took the loss. Lieb, playing third base in the game, led the team with two hits. Game 3 - Win 12-5 vs Anne Arundel Heat. NYFA jumped out to a 4-2 lead in the first inning and continued to build on it. MacKay earned the win, with Loudenslager pitching in relief. The team tallied 13 hits, with Irwin, Loudenslager, MacKay, left fielder Abby Fetrow, and second baseman Ashley Folk each collecting two hits. Folk led scoring with 3 RBI. Game 1 - Win 6-4 vs Northampton Hawks. Polar Elite's first bracket play game ended in dramatic fashion. In the bottom of the seventh inning with the score tied 4-4, Rylee Martin reached base on a hard hit ball with one out. Then with two outs, Loudenslager and Kemper reached base with a walk and single, respectively. With the bases loaded, two outs, and one strike on her, MacKay lined a single into left-center field to score two runs and end the game. Kemper and Loudenslager combined for the win. MacKay and Kemper combined for five of the team's six hits in the contest. Fetrow had the other hit. Game 2 - Loss 8-2 vs New Jersey Maniacs. Polar Elite lost the lead late in the game to the eventual third place finishers. Kemper started the game on the mound and was relieved by Loudenslager, who took the loss. Four errors in late innings were the downfall. MacKay led the offense with two hits. Third baseman Rebekah Wiley also had a hit. Game 3 - Win 11-2 vs Ocean City Bombers. A huge 11-run first inning propelled the team to a win with solid pitching from Kemper, Loudenslager, and Madisyn Saposnek. Loudenslager, MacKay, Irwin, and Folk each had two RBI in the contest. Irwin and Loudenslager each had triples. Game 4 - Win 11-0 vs Shenandoah Mavericks. Kemper threw a two-hit shutout and was supported by an offense that had a six-run second inning and five-run fourth inning. Loudenslager led the way with three hits and four RBI, including two doubles. Saposnek also collected multiple hits. Game 5 - Loss 5-4 vs Staten Island Saints. In their fourth and final game of the day, Polar Elite lost a heartbreaker to the eventual fourth place finisher. With the game tied at 4-4 in the fourth inning, the Saints scored a run to take the lead and never relinquished it. Loudenslager started the game on the mound and was relieved by Kemper, who took the loss. MacKay pitched two and a third scoreless innings to close the game. Outfielder Paige Webster led the offense with a double, walk, and two RBI. Loudenslager added two hits, while Kemper and outfielder Taylor Itterly each had hits. The team is now 30-15-3 on the year. 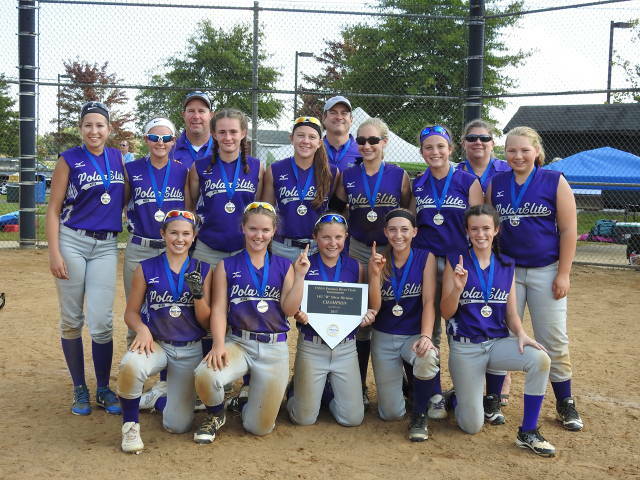 14U Polar Elite's final tournament is the USA Softball 14B Eastern Nationals in York, PA on July 26-29. NYFA's 14U Polar Elite team competed in two tournaments recently. The first was the three-day PA Softball Memorial Day Madness in Upper Allen and Lower Allen Townships. The tournament featured 68 Class A and B 14U teams from nine states and Canada. Polar Elite is a Class B team, which generally means that the team consists of players from a small geographic area (e.g., a single county). Class A teams recruit players from multiple counties and/or states. NYFA finished with a 4-4-1 record and took second place in the platinum championship bracket. All four losses were against Class A teams. Pool Play, Game 1 - Tie 7-7 vs Rock Sports Academy. Second baseman Ashley Folk, shortstop Maya Kemper, and pitcher Paige Loudenslager each had multiple hits for Polar Elite. Pool Play, Game 2 - Win 3-1 vs Akadema Elite Futures. Pitcher Alyssa MacKay tossed a complete game on four hits and with a perfect defense behind her. Loudenslager led the offense with a double and a triple. Pool Play, Game 3 - Win 4-0 vs Maryland Patriots. Pitchers Madisyn Saposnek and Loudenslager combined for a four-hit shutout. Saposnek and right fielder Taylor Itterly led the offense with extra base hits. Pool Play, Game 4 - Loss 12-0 vs Diamond State Swoop. The eventual gold bracket playback champion, Swoop, made quick work of Polar Elite. The impressive Swoop dominated all aspects of the game. Pool Play, Game 5 - Loss 12-0 vs PA Chaos National. The eventual gold bracket champion, who went 10-0 in the tournament, put away Polar Elite early. Pool Play, Game 6 - Loss 9-3 vs East Coast Tsunami. Polar Elite led the Class A Tsunami team 3-1 heading into the final inning before the wheels fell off. One of the positives in the game was a highlight reel double play to end the third inning. Center fielder Hailey Irwin caught a fly ball and threw a laser to catcher Rebekah Wiley, who blocked the plate and tagged out the runner tagging up from third base. Outfielder Abby Fetrow lead the offense with two hits. Quarterfinal - Win 4-3 vs TNT West Cardinal. Polar Elite held off a late surge by TNT to win its quarterfinal game in bracket play. MacKay threw a gem, allowing no earned runs over 5 2/3 innings. Loudenslager led the offense with a pair of hits and two RBI. Left fielder Rylee Martin secured the win with a line drive putout with the tying run in scoring position. Semifinal - Win 5-2 vs PA Outlaws Elite. Polar Elite score four runs in the first and kept the lead throughout. Pitchers Saposnek and Loudenslager combined for the win. The offense was led by catcher Shay Lieb, who had a pair of hits, and Saposnek, who drove in two runs. 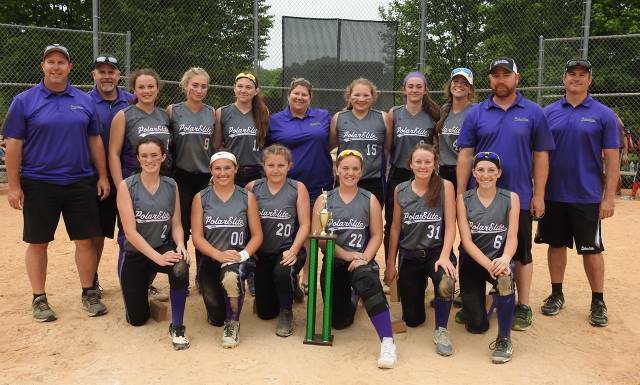 Championship - Loss 7-3 vs South Jersey Mystics. The final game featured a match-up against a well-rounded Class A team from New Jersey. Polar Elite was not able to overcome an early 4-0 lead by Mystics. MacKay and Loudenslager each had three hits for Polar Elite. Folk, Lieb, and Kemper each contributed hits in the loss. The second tournament was the June 2-3 USSSA Happy Valley Showdown in State College, PA. This tournament featured 24 Class A and B teams from all parts of PA. Polar Elite posted a record of 2-1-1 in pool play on Saturday. Unfortunately, weather did not cooperate on Sunday and the bracket play games were cancelled. Polar Elite's pool play record placed them 9th overall in the tournament. Game 1 - Win 5-0 vs Thunderstorm. Polar Elite started its day by blanking Thunderstorm thanks to good pitching and defense. Saposnek earned the win. The offense was led by outfielder Irwin with two hits and a walk, and third baseman Loudenslager with a double and three RBI. Game 2 - Loss 9-2 vs Central PA Havoc. The Class A Havoc jumped to a 4-0 lead in the first inning and never looked back. Polar Elite's defense and pitching were not in top form, and bats were silent. Saposnek had two of the team's four hits. Game 3 - Tie 6-6 vs Central PA Krunch. Polar Elite took an early 5-0 lead again Krunch, but could not hold on to it. Kemper pitched a solid game in her first full game back since a fractured hip injury sidelined her for a month. Center fielder Irwin and shortstop Loudenslager led the team with two hits apiece. Saposnek contributed with a home run in the third inning. Game 4 - Win 4-3 vs Scream. The final game of the day was a nail biter. Scream evened up the score two times during the game and then took the lead in the top half of the final inning. Loudenslager led off with a single, then Kemper drove her in with a single to tie the game 3-3. Saposnek and Lieb then reached base to load the bases. Next, outfielder Paige Webster hit a hard line drive right to Scream's second baseman, who caught it and then doubled up the runner at first base. With two outs and runners at second and third base, MacKay delivered a walk-off hit to center field to seal the victory for Polar Elite. The team is now 18-11-2 on the year. Polar Elite's next tournament is the USSSA Red State Championship in Chambersburg on June 23-24. 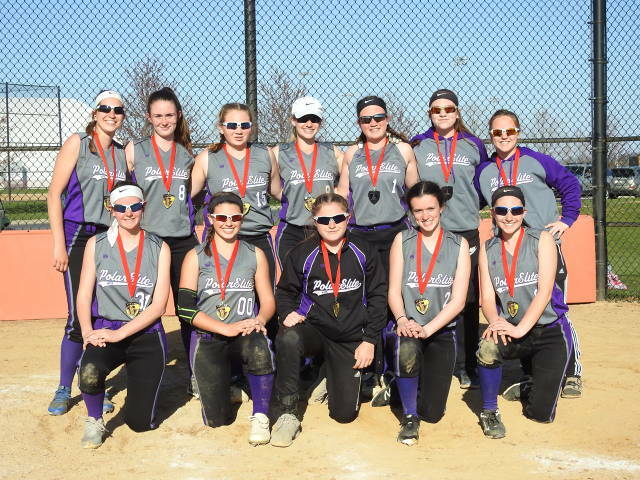 NYFA's 14U Polar Elite's first tournament of the season was the Diamond Havoc at In the Net in Palmyra. Despite losing two of their starters in the first game to injuries, Polar Elite went 4-2 overall, finishing in second place. Game 1 - The girls rallied from an early 7-0 deficit to beat the Stonersville Flames 8-7. A series of big hits, including triples by catcher Rebekah Wiley and outfielder Taylor Itterly, helped to push the team ahead in the last inning. Game 2 - Polar Elite stayed in control the whole game against Winning Edge Energy, winning by a score of 8-2. Madisyn Saposnek pitched a complete game with 6 strikeouts and helped herself at the plate with a pair of hits and a walk. Catcher Shay Lieb reached base in all 3 of her at bats, which included a 2-run triple to score the team's first runs of the game. Game 3 - In the third pool play game on Saturday, Polar Elite lost a hard fought matchup with Loyalsock Elite 6-3. Alyssa MacKay allowed 1 earned run in 3 innings of work in the circle. Outfielder Ashley Folk was the only Polar Elite player to reach base more than once in the game. Quarterfinal - NYFA squared off against the Keystone Stingers in the quarterfinal game of bracket play. Polar Elite's bats were on fire, ending the game by mercy rule 14-1 in 3.5 innings. Folk, Saposnek, and Wiley each had multiple hits. Semifinal - Polar Elite's 4 runs in the 3rd inning were enough to squeak by the Mountaineer Pride of West Virginia by a score of 4-3. Folk, MacKay, Saposnek, and Wiley contributed hits in the winning effort. Championship - The final game featured a rematch with the Stonersville Flames. This time, however, the Flames were victorious in what was an exciting extra-innings game. Polar Elite led the Flames 9-2 after 3 innings of play. The Flames chipped away at the lead inning by inning, eventually tying the game in the 7th inning. In the first extra inning, the Flames scored 4 runs while Polar Elite failed to score. The game ended 13-9 in the Flames' favor. In addition to Lieb, Saposnek, and Wiley, outfielders Rylee Martin and Paige Webster each had hits in the contest. Head coach Jeff MacKay said of his team's effort, "I'm proud of the way we played. We overcame injuries to three of our second-year 14U players and were competitive in every game. When healthy, I'm confident that this very talented group of players will compete for many more championships." Including a couple of tournaments in the fall, the team is now 12-6 on the year and have two weeks off before they head to York for the Crist Kickoff. Their 3rd place finish in a field of 32 teams in Strike Out Autism tournament in October 2017 qualified them for the USSSA 14U Class B World Series. They will be making the trip to Ocean City, MD in July to compete in the World Series. The 2017-18 travel season kicked off in Virginia on Sept. 16 for the 14U Polar Elite team! After going 1-2 with 3 hard-fought, close pool play games on Saturday, Polar Elite 14U returned on Sunday going 2-0 in bracket play, putting them in the Championship game. Facing the Virginia Stingrays in their home state, Polar Elite pulled ahead after allowing an early 4-run inning with a fight to the finish to win 1st place with an 8-5 victory!